Introduce your students to great artists and the techniques that made them famous. 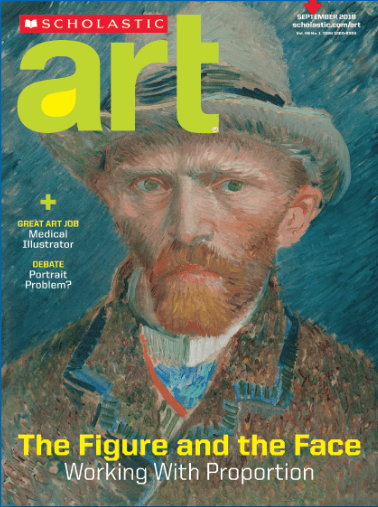 Expand your curriculum with nonfiction about renowned classic and contemporary artists. Art history nonfiction thoroughly examines influential artists from diverse backgrounds, time periods, and movements. Unique studio projects give students hands-on practice applying the techniques of the masters. Contemporary art features take a look at today's most groundbreaking artists and artworks. Meet rigorous state standards with complex informational texts, art vocabulary used in context, and text-based writing prompts. Interviews with working artists detail a wide variety of exciting arts careers and connect art lessons to the real world. EXPANDED Teacher’s Guides feature complete lesson plans, essential questions, and enduring understandings as required by the National Core Visual Arts Standards. Scholastic Art Online features digital editions, videos, printable quizzes, activities, and art vocabulary handouts. - абонамент 2014/2015 г. - 24.00 лв. - абонамент 2015/2016 г. - 27.00 лв. - абонамент 2016/2017 г. - 30.00 лв. - абонамент 2017/2018 г. - 33.00 лв.